Jewellery is always a popular choice for Christmas gifts, and this year, the trend for semi-precious jewellery is bigger than ever, so it's the perfect time to pick out some statement pieces. When I was younger, I used to buy a lot of my jewellery from high street shops like New Look and H&M, but the older I get, the more I want to invest in better quality pieces with real gemstones. Some of my favourite pieces are vintage finds that I've discovered in flea markets, charity shops and the occasional auction house, and whenever I look for 'new' jewellery, I tend to gravitate towards styles that have an 'old' feel about them. The same goes for when I'm purchasing jewellery as a gift - I think there's something so wonderfully timeless about a classic looking piece that someone will cherish for many years to come, and I was particularly excited when Gemstone Silver Jewelry asked if I'd like to review some of their rings. One look at their website and I was smitten! 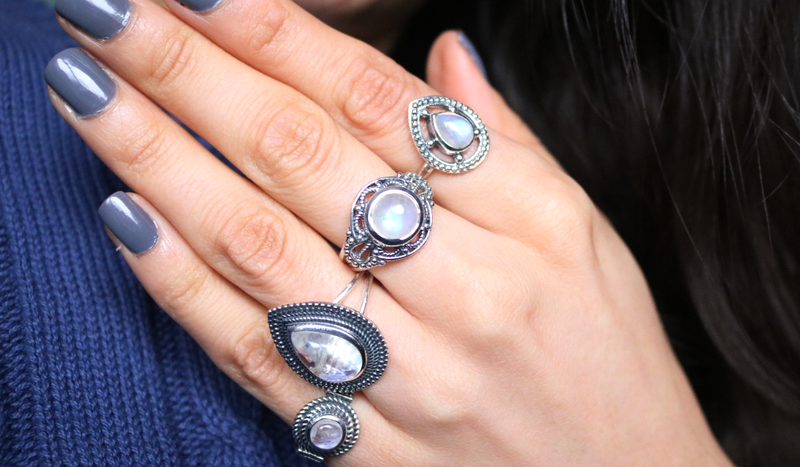 Gemstone Silver Jewelry is a US online retailer who specialises in Moonstone jewellery and they have a strong bohemian and vintage-esque style that I love (they also have a whole range of healing chakra jewellery which looks amazing, so it's well worth checking out). They kindly let me choose some rings to review and they are absolutely beautiful! 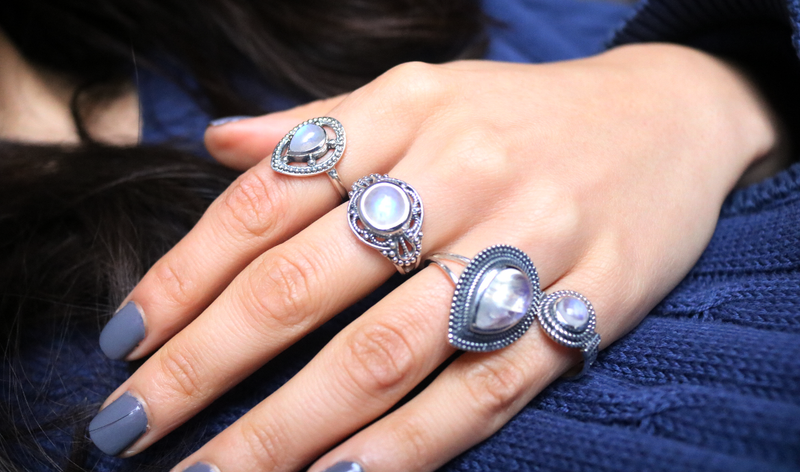 All of Gemstone Silver Jewelry's natural rainbow moonstones are ethically sourced from around the world, and the Azure Drop Ring is striking enough to be worn as a statement piece, but also small enough that it can be layered with other rings (such as midis etc) if desired. Set in 925 sterling silver, it's available in a range of different sizes. The Shielded Beauty Ring is inspired by ancient Hindu jewellery designs and features an intricate display of 925 sterling silver that embraces a natural round rainbow moonstone at its centre. I quite like wearing this one on its own and it's received many compliments from family and friends. Embrace your inner hippy goddess with this boho classic - an eye-catching large Dreamy Teardrop Ring! I've always wanted a ring like this, and the sheer quality of both the sterling silver setting and the teardrop shaped moonstone is even better than I expected. 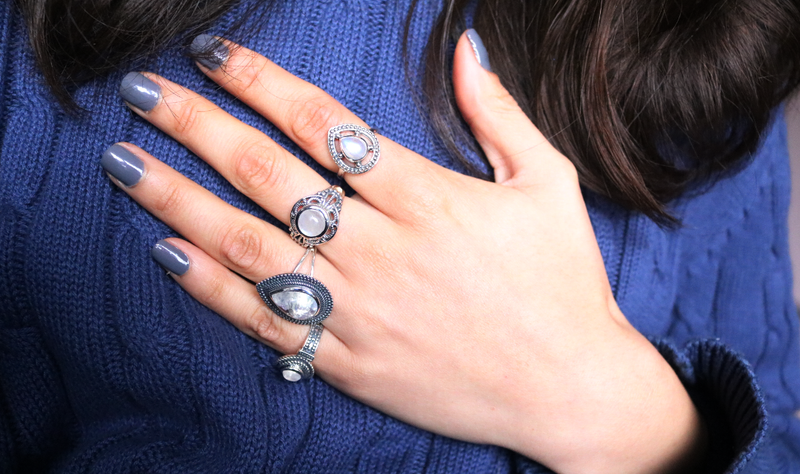 The large moonstone really catches the light and reflects an enchanting spectrum of silver, blue and purple hues. Perfect for stacking, the Neat Enticement Ring is another sterling silver, classic boho-inspired style of ring, and its smaller size is ideal for those who enjoy layering their jewellery to compliment their outfit. I find this one so easy to wear because it just seems to go with everything! Do you like receiving jewellery for Christmas?